Vendido y enviado por Joy Co.
¡El mejor caballero oscuro ha llegado! - Capucha para todas las acciones de lucha contra la criminalidad. - 13 puntos múltiples de articulación. - Caja expositora para ventana. - Aproximadamente 12,7 cm de altura. considering how awful the rest of the Batman Begins line was, this figure is probably the best of them all. despite only having one accessory, this figure comes with two features that make it stand out. for one, the figure has a rubber finish to it to simulate the rubberized texture of the Batsuit in the movie. and this figure has a big posable cape so you can position it to complement the figure's pose. because of the lack of accessories and the posable cape, this figure is probably best suited as a display piece rather than a toy for little kids to bang around with their other toys, and collectors are more likely to keep this toy in its box anyway since it is a "Collector's Edition" figure. Well detailed and made of strong materials. Any kid would consider it cool looking, and the large cape is poseable, as is the caped crusader himself. Be aware that the small hand-held bat which comes with it doesn't hold well in the hand, and will get lost within 14 seconds of opening the package. Also, poor Batman has broken in half once or twice, but after some spinal fusion with Superglue, he seems to be fully recovered. This action figure is probably better for the 8-year-old crowd rather than the 4-year-old crowd. Great item. Item arrived nicely with no packaging problems. 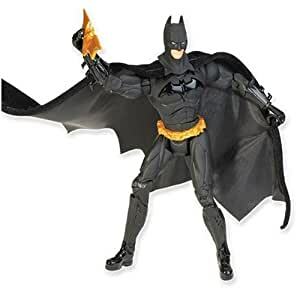 Excellent toy, not corny like all the other joke of a batman toy that is out there (ultra parachute laser guided stealth underwater space suit batman). I thought it would be 8 inches tall, guess I didn't read the fine print. But a blast to play and look at.